This IC testing circuit can test any of the 555 timer IC. This is done by testing whether it is oscillating or not. By using this tester it can be immediately tested whether the timer is functional or not. It also tells if it is shorted or oscillating. If the LED are flashing, the timer is in good working condition and if the LEDs are OFF or on solid then it is defective. It can also be used as a trouble shooter in 555 based circuits. Resistor is an electrical component that reduces the electric current. The resistor's ability to reduce the current is called resistance and is measured in units of ohms (symbol: Ω). 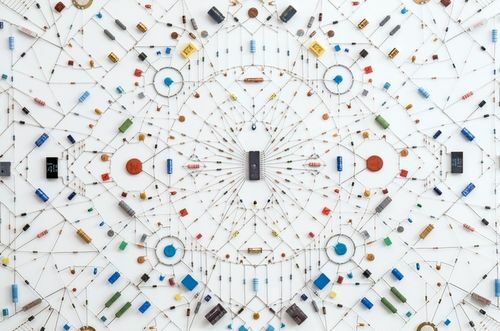 Capacitor is an electronic component that stores electric charge. The capacitor is made of 2 close conductors (usually plates) that are separated by a dielectric material. The plates accumulate electric charge when connected to power source. 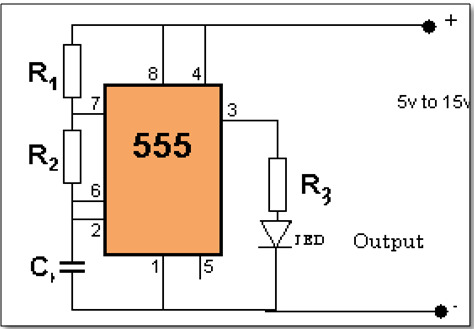 The 555 timer IC is invented by Mr.Hans camenzind ,it is an integrated circuit (chip) used in a variety of timer, pulse generation, and oscillator applications etc. 20 mA is a Max Current ;Max voltage across Led is 5volts. Above figure shows the circuit diagram of a 555 Timer wired in Astable Mode. · 8th pin and 1st pin of the IC are used to give power, Vcc and GND respectively. · The 4th pin is RESET pin which is active low and is connected to Vcc to avoid accidental resets. · The Trigger (pin 2) and Threshold (pin 6) inputs are connected to the capacitor which determines the output of the timer. Discharge pin (pin 7) is connected to the resistor Rb such that the capacitor can discharge through Rb. When the circuit is switched ON, the capacitor (C) voltage will be less than 1/3 Vcc. So the output of the lower comparator will be HIGH and of the upper comparator will be LOW. This SETs the output of the SR Flip-flop. Thus the discharging transistor (Q1) will be OFF and the capacitor C starts charging from Vcc through resistor Ra & Rb. When the capacitor voltage will become greater than 1/3 Vcc ( less than 2/3 Vcc ), the output of both comparators will be LOW and the output of SR Flip-flop will be same as the previous condition. Thus the capacitor continnously to charge. When the capacitor voltage will becomes slightly greater than 2/3 Vcc the output of the higher comparator will be HIGH and of lower comparator will be LOW. This resets the SR Flip-flop. Thus the discharging transistor turns ON and the capacitor starts discharging through resistor Rb. Soon the capacitor voltage will be less than 2/3 Vcc and output of both comparators will be LOW. So the output of the SR Flip-flop will be the previous state. So the discharging of capacitor continuous. 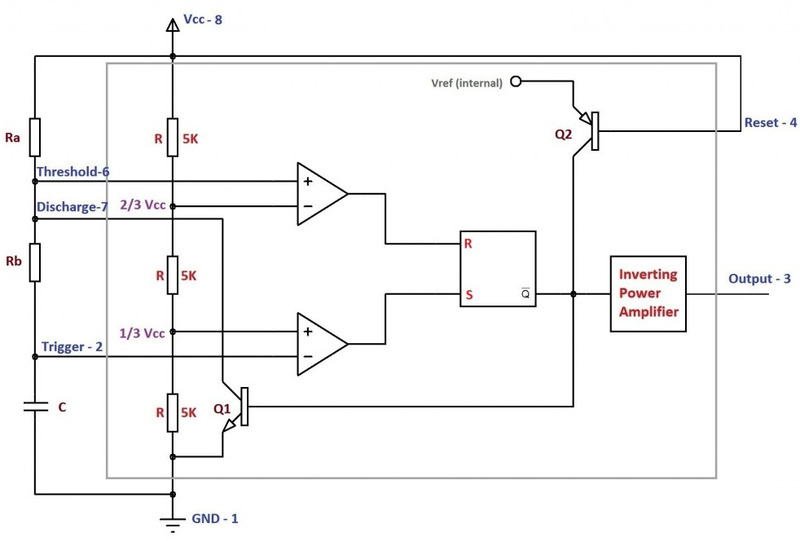 When the capacitor voltage will become less than 1/3 Vcc, the output SETs since the output of lower comparator is HIGH and of higher comparator is LOW and the capacitor Starts charging again. This process continuous and a rectangular wave will be obtained at the output. · A small amount of maintenance is needed in case of battery being drained . there have been 12840 visitors (23454 hits) on this page!